I previously posted the little airplane video I made for my nephew's birthday party. 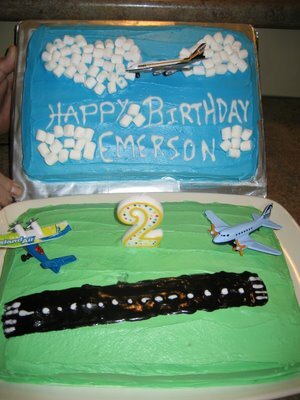 He turns two today, and his parents threw him a party last weekend with an airplane theme. I was lucky enough to be able to attend. I brought a few aviation gifts for him. I had given him a shirt a year ago that said "I want to be an aviator." 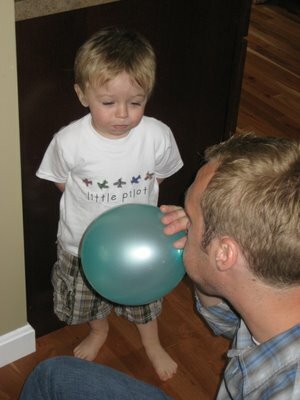 His parents told me that he wanted to wear it every day, so I found a couple more t-shirts with airplane themes, both of which you can see in the photos above and below. I also got him a bedding set with airplanes all over. 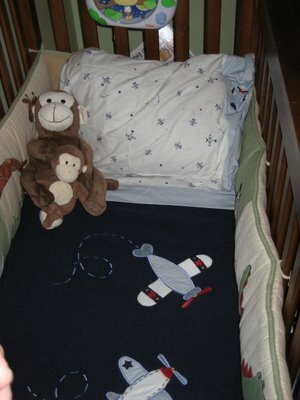 When it was time for bed, he kissed the airplanes. My brother, Wes, and I had a great time decorating the cakes, blue sky over green turf. I made the runway! My favorite part, though, was showing him the video. My sister caught his reaction on video. 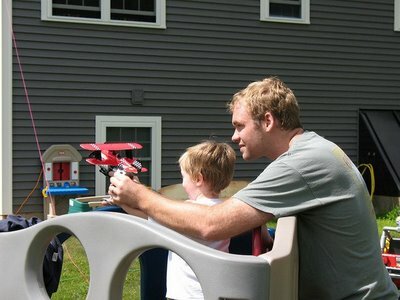 Afterwards, we all went outside to play with the airplane I got him. That was fun for all of us, even when we had to climb trees to get it back! Overall, it was a very exciting time for an airplane-crazed little boy. 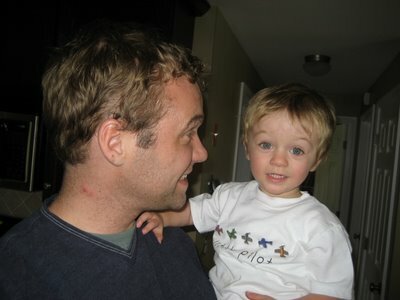 You can see more photos from his birthday on Emerson's own website. Happy Birthday, Emerson! My brother and sister-in-law are at the hospital. They just gave birth to Emerson's little brother (Owen Perry Brown, 7 lbs., 9 oz., 20"). 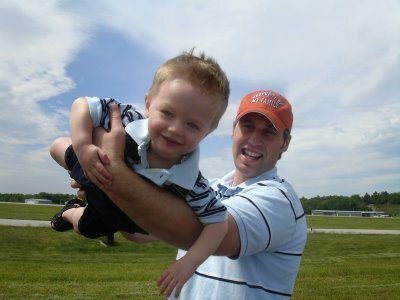 My mom is with Emerson, my two year old nephew featured in my previous entries. They were in the park this morning when two small planes flew over. My mom pointed them out. Emerson looked at them for a moment, then said, "Hi, Greg." I can't get over how much I love that little boy. I had to be in Boston on Friday for work, so I booked my return flight on Sunday so that I could spend the weekend with my family. My nephew's birthday party went off with an airplane theme, and he was really cute as he watched the little video I made for him. Since I was going to be in the area, I had planned to get checked out so I could rent airplanes from the airport near my parents' house. I was scheduled for the checkout flight on Sunday morning, but on Saturday afternoon I had some time to kill so I stopped by the airport. 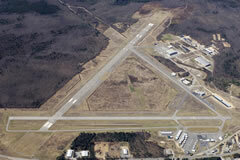 Southern Maine Aviation is based in a large hangar on the West Ramp at Sanford Regional Airport (KSFM). When I walked into the hangar, I was confronted with a PBY under restoration, an L39 that was polished like a mirror, a Diamond DA40, and a handful of Cessnas in various states of disassembly. The guys there were great. There was no apparent work going on, but there were three or four employees hanging around and talking. They decided to take care of the paperwork, since I had dropped by, then asked if I'd like to see the planes. 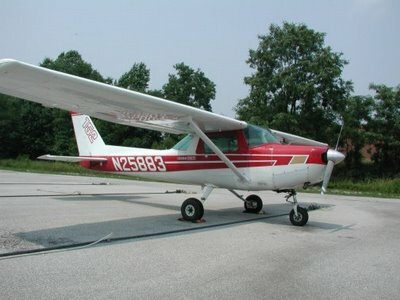 They have a Cessna 172M, the same model as Three Five Romeo, in which I did most of my training. They also have two 172SPs, a 2003 model and a 2004 model. Then there's the Diamond DA40 and a Citabria. I'd never flown a 172SP. It has 20 more horsepower than any 172 I've flown, and a dual-axis autopilot, and is a really nice plane. It turned out that if I checked out in the SP, then I could rent either the SPs or the M-model. If I checked out in the M model, I would need another checkout to rent the SPs. It was a no-brainer for me. My dad and I arrived at the airport on time (after the obligatory run through the Dunkin Donuts drive-through) and I met the instructor. We sat down for 2 minutes to talk about different things, then he took me out and I pre-flighted the plane. The instructor suggested that my dad could come in the back seat, but when I did the weight and balance calculations, we were 150 pounds over the maximum gross weight. The instructor said,"You're PIC, but I can tell you that it would be fine." Holds the appropriate category, class, and type rating, if appropriate, for the conduct of the flight. The instructor was correct -- I was PIC. A student pilot flying the plane with an instructor is NOT pilot in command. 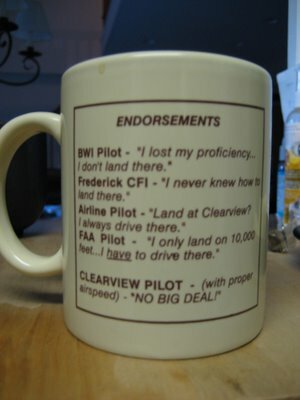 A certificated pilot, however, is in most circumstances PIC if he is flying the plane, even when flying with an instructor. In this case, I was PIC, which meant that I had "final . . . responsibility for the . . . safety of the flight." It was a plane I had never flown before, in an area I had never flown in. Although I have flown almost exclusively planes of the same model, this one had some features (engine power, autopilots) that were different than any plane I'd flown. Further, as part of the checkout, we were going to do some basic maneuvers, such as stalls, slips, etc. And now I was being asked to fly the plane while exceeding the maximum gross weight set by the manufaturer and FAA certification. How could I take responsibility for the safety of the flight in those circumstances? I also thought of what my dad would take away from the experience. He's reading Stick & Rudder and studying while looking forward to maybe taking flying lessons. As I was standing there, I asked myself whether I wanted to take responsibility for anything he would learn from seeing me "bend" the rules. There was also my personal philosophy regarding flying safety. It can be articulated several different ways. One way to state it is to say that I am committed to always taking the conservative approach in aviation. Another way I have articulated the philosophy is to say that if I have to seriously consider and weigh whether something is safe or appropriate, then I will not do it. I caught myself standing there and thinking, "It's not legal. But the FAA issues permit for overweight ferry flights, which it wouldn't do if it was unsafe. But it's not a good example. But we're not doing any maneuvers that will put a load on the wings." When I caught myself weighing factors back and forth, I knew that I could not make the decision to do it, at least not while staying true to my commitment to always make the conservative decision regarding flying. There was no way. "Dad," I said, "I think I'd rather take you up after the checkout flight." My dad immediately said, "No problem," and started walking away. I could tell he was disappointed, and it tore at me a little. I was really angry at the instructor for suggesting he could come without first confirming that the flight could be made legally under those circumstances. What is an instructor doing suggesting that rules regarding the safe operation of a flight can be bent and broken? And why couldn't he have not said anything until he had talked it over with me privately, especially since I WAS PIC? My dad later said that he thought the instructor was testing me to see if I would fly with the plane over gross weight. The disappointing thing about it is that the instructor was not testing me. He graduated from one of the big colleges with an aviation degree, has all of his instructor certificates, etc. In the plane, he told me how when he was in college they would routinely take planes out with several students and full fuel, way over gross. He said they would just burn off fuel before starting any maneuvers. And I've heard bush pilots say that a Piper Super Cub handles best when 500 pounds over certificated maximum gross weight. The plane might have climbed a little slower, but with that 180 horsepower engine, it would have climbed just fine (it climbed at 1,000 feet per minute with the instructor and me). The air was cool and dry, there was no turbulence and only a light wind. Our maneuvers did not impose any heavy loads on the airframe. And by the time we returned to the airport, we would have burned off 60 pounds of fuel before landing, so been closer to the weight limit (albeit still over). It would almost certainly would have been fine, which made it harder to make the right decision, but I don't doubt that was the right decision. As things turned out, I did not have the chance to take my dad flying after the checkout flight. We had to meet my mom and sister, then go to my nephew's birthday party, and then I had to catch my flight home. There just wasn't time. But now I'm checked out, and I can go back and take my dad up whenever the weather and our schedules permit. The SPs are NICE planes, and we're going to have a great time when it finally works out. I can't wait. Other than just wanting to be in a plane with my dad, one of the reasons I can't wait to fly again up there is that the air is SO much clearer in New England. When we were perhaps 1,500' in the air after taking off from the Sanford airport, it seemed like I could see forever. The White Mountains of New Hampshire were off to the right and clearly visible except for Mount Washington, which was making its own weather and covered by a cloud. To the south, just off our nose, was the distant skyline of Boston, also clearly visible from 60 NM (about 70 "regular" miles) away . Between us and Boston, Pease International Tradeport (KPSM) was visible 20 miles away, as well as the City of Portsmouth, New Hampshire. Off to the Southwest, the instructor pointed out the Class C airport in Manchester, New Hampshire, 40 miles away. I wondered, if I climbed another 1,000 feet higher, would I be able to see Worcester, Massachusetts, where my brother and sister-in-law live, 85 miles away? We turned to the East. Looking Northeast, there was a hook of land jutting into the Atlantic -- Kennebunkport, where the first President Bush has his house. Further on, Biddeford and then Portland were also visible. I could see Boston sixty miles away! Where I live and do most of my flying in the mid-Atlantic, 5 miles of visibility is a decent day, 7 miles is pretty good, and 10-12 miles is terrific. Sometimes in cooler weather, usually at night or the early morning, the visibility can be better, but I have never had visibility like I did at 1,500 feet over Sanford, Maine. It was the most beautiful flight I've had to date, and I really cannot wait to get back up there again. Without that instructor. Where does the yearning to fly and love of flying come from? Long before my first flying lesson, I was certain that I knew what it felt like to fly. My dad, though not a pilot, was in the Air National Guard and Air Force Reserves, and loved planes. So maybe the seed was planted in me simply by my father talking about airplanes and flying. But I wonder.... I have a friend in my flying club that has twin little girls. One of them absolutely loves airplanes, and yells "Clear Prop!" when her parents put their keys in the ignition to their car. Her twin sister, though, apparently doesn't care that much one way or the other. 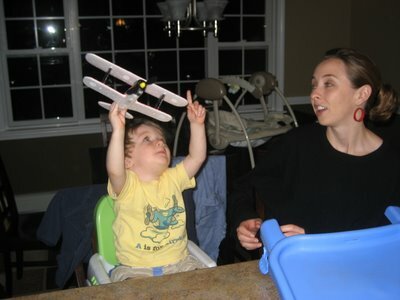 My nephew, Emerson, seems to have been born with the love of airplanes. 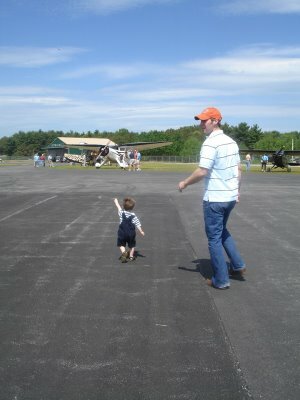 His parents took him to an airshow when he was about 20 months old and he was enthralled. They had to chase him all over the tarmac as he looked at the planes. After a second airshow, he started "flying," holding his arms back like a swept-wing jet and running around the house -- and this is a kid who's barely old enough to stand up by himself! 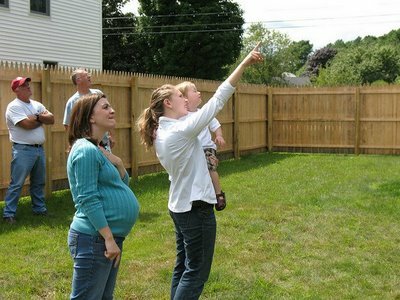 Neither of his parents had any real, expressed interest in airplanes and flying.... (They have more of an interest now!) I put together a little montage for his airplane-themed second birthday. Take a look, then tell me, where does the love of airplanes come from? I wrote last week about wanting to get "checked out" in a 182. I've been fascinated with that airplane because it's kind of fast compared to a 172, very stable, and will haul four people and luggage. Pilots gripe about it's handling, saying it handles like a truck. But that's not necessarily a bad thing. I mean, I would love to fly a plane that's very responsive and just carves up the sky. The kind of flying I want to do most, though, are 400-mile trips to Maine and Tennessee. That is, flying in straight lines at higher rates of speed, in all kinds of weather. Big and stable is kind of appealing for that kind of trip, so I've really been looking forward to getting checked out in the 182 owned by one of my clubs. Who knows, perhaps I'd want to own one someday, and flying one owned by my club would be a good way to find out. I've updated my Flying playlist, so I'm re-publishing it. Today I got checked out in a Cessna 152. 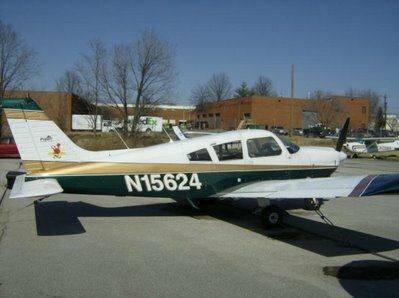 Now, this plane is nothing special -- probably more student pilots have learned to fly in 152s than in any other plane. But it's very small, a little two-seater with only 110 horsepower. With full gas tanks, it can carry only 345 pounds and I doubt it can hit 100 knots in level cruise. But I learned in a 172, which is the larger, faster, four-seat version, so I've never had the experience of flying one of these little things. I wrote earlier about my attempts to get an instructor light enough to check me out in the 152, and this morning her schedule and mine came together to get it done. We met at 9:00 and sat in the Airport Cafe for a while to go over some information about the plane and talk about the flight, then we went out, did the pre-flight inspection, and took off. The first thing I noticed is how light the elevator forces are compared to a 172. Since the 152 is so light (only 1,670 pounds fully loaded!) every little burble in the air seemed to knock it around -- at first it felt more like flying a kite than an airplane. By the time we got to the practice area, though, I had a much better feel for the plane. Meredith (the instructor) asked me to do a steep turn. In a Skyhawk, I'll usually add some nose-up elevator trim to help hold altitude during a steep turn. Since the elevator forces were so light in this plane, though, I figured I'd give it a shot without any trim. Well, I underestimated how much elevator force would be needed and lost 100 feet within a few seconds. That helped me dial in how much control force it took, and I did it twice more. Stalls were non-events. I've had trouble getting a 172 to break into a stall with just me and a 200-lb instructor in the front seats, as I did on my checkride. The 152 seemed to have a slightly sharper break, which I actually like. That is, I like a sharper break when I'm practicing stalls and stall recovery. We did a few landings at Carroll County Airport, then stopped to top off the gas tanks. The gas at Carroll County was $4.19 per gallon, compared to $4.95 in Gaithersburg. Gaithersburg is such a ripoff that everyone tries to fill up when they're away. After taking off from Carroll County, we headed to Clearview Airpark. The long runway in this picture is Boston-Logan's Runway 33 Left, which is about 10,000 feet long and 150 feet wide. The middle runway is Gaithersburg, where I learned to fly. That runway is about 4,200 feet long and 75 feet wide. The small one on the top is Clearview, all 1,840 feet of it. (By the way, all three runways in this image are actual satellite photos and are the same scale.) 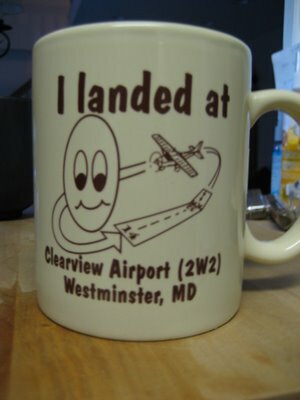 Clearview's runway is only 30 feet wide, three feet narrower than the wingspan on a Cessna 152. Both Boston and Clearview have a little bit of extra runway that you can use to get a running start for takeoff, but you can't use it for landing. I approached the runway three times today. The first time we were just going to overfly the runway, which was good because I was about 10 knots too fast for a good short-field landing. The second time wasn't right either. The third time, Meredith had me fly a higher pattern and a longer final approach. That gave me time to get the plane steady at 55 knots, which is the right airspeed for that plane, and on the right approach angle. It was a bit bumpy as we came over the trees, but I got it down. As we pulled off the runway, I was drenched in sweat. There was no way I was going to take off again without getting "The Mug." On the front of the mug, in the drawing of the runway -- do you see that dip? When Meredith and I lined up on the runway to take off, Meredith told me that after our downhill run, if we weren't off the runway when we came out of the dip, I should abort the takeoff and hit the brakes. I held the brakes at the end of the runway and gave the plane full throttle, then released the brakes and we started to roll. I pulled it off just as we hit the rise. We climbed up and cleared the trees by a good margin, at least 40-50 feet, then headed back to Gaithersburg. So all in all..... I really love flying that little 152. It's fun, although when the air is bumpy it tends to get tossed around a lot. Still, it's really great to buzz around in. And Clearview? Well, I'm grateful to Meredith for taking me in there, and now that I've done it once with an instructor, I'll go back. It's a good challenge, and if nothing else, it will help me keep my go-around technique sharp. It was a good day of flying. It is hot as blazes here in the DC area, over 100 degrees and very humid. What else is there to do but go flying? I've been trying to fly a lot the last couple of days. The workload in my job is momentarily light, and there's a lot I want to do.... I want to get "checked out" in planes my club has that I've never flown before. There's a Cessna 152, which is a small, slow, 2-seat airplane. There's a Piper Cherokee 235, which is faster and more powerful than anything I've flown, more complex, and will haul a LOT of stuff. 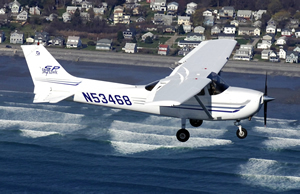 There's a Cessna Cardinal, which is similar in some ways to the Cessna Skyhawks (aka 172) I trained in, but faster and more complex. Then there's a Cessna 182. If the 172 is a Honda Civic, the 182 is a Cadillac with a V-8 engine. Faster, more complex, "drives" like a tank, and can carry a LOT more. Getting "checked out" in these planes means more instruction -- anywhere from 1 to 10 hours each, depending on the plane. And, of course, I also want to get my instrument rating. The requirements for the instrument rating are more substantial. I have to pass a written exam. I have to log 40 hours of actual or simulated instrument flying time, including at least 15 hours of instruction. I need to log 50 hours of cross-country flying time as "Pilot in Command," and I also need to do a long (250 mile) cross-country flight under instrument flight rules, with three different kinds of instrument "approaches." Once I've got that all done, I have to go for an oral exam and flight exam with the FAA Designated Examiner. I was going to start the "checkout" process yesterday morning. Rich agreed to meet me at 5:30 in the morning for my first instruction in the Cherokee 235. When we got to the airport, though, it was foggy, and the visibility was not good enough for us to fly, so we spent an hour going over the plane and its various systems, orally reviewing procedures, and so on. We also rescheduled for again this morning, this time at 5 a.m. Well, Rich called me at 4:15 to say that the visibility was marginal, and we cancelled again. I went back to bed, but not for long. John, who did a bunch of my private pilot training, is going to be my instrument instructor. We met at the airport at 9 this morning for my first instrument flying lesson. Within moments after taking off, John had me put the "hood" on so that I could see only the instruments. It was very hot, and very bumpy, and it required nearly all of my concentration to keep the plane flying straight and level. Then John reached over and stuck a suction-cup cover over one of the gauges. Statistically, pilots without instrument training last about 2 minutes when that gauge fails, before spiraling into the ground. Fortunately for me, though, John had taught me during private pilot training not to rely on that gauge. I was unfazed when he covered it. Yes, you're 3,000 feet in the air moving at 120 mph. No, you can't look where you're going. Don't crash. Then he covered another gauge, the directional gyroscope. This one made it a bit more difficult. Now, if I wanted to turn East, say, I would have to look at the second-hand on the clock and time my turn, straightening out at the right moment. It was still not a problem, but only because of a "lucky break," literally, that I'd had during my private pilot training. During one training flight with John, the directional gyroscope had broken. John had taken the opportunity to put me under the hood and practice turns without the benefit of that gauge. At the end of the flight, John gave me specific headings and altitudes to fly. When he finally told me to take the hood off, I was about 1/2 mile from the end of the runway at Gaithersburg and 400' off the ground. I'd like to say that I turned in a "greaser" of a landing, but it was not to be. It was windy and gusty, and a gust during the flare meant a rather "firm" landing to wrap up the flight. I had a third flight scheduled for later this afternoon. The Cessna 152 is a very small plane. If the gas tanks are full, it will only carry me and a second person who has to be 125 pounds or lighter. There's only one instructor on the whole airfield that is lighter than 125 pounds, so I scheduled to fly with her this afternoon to get checked out in that plane. Well, when I got to work after my instrument flight, there was a message from her cancelling the flight because it's too hot. Cessna 152 - Ain't it cute? All in all, I've only flown one out of four flights that I scheduled for yesterday and today, but I'm still happy, mostly because my instrument flight went so well today. Next time we're going to start "VOR approaches," and there's plenty of homework for me to do before then. 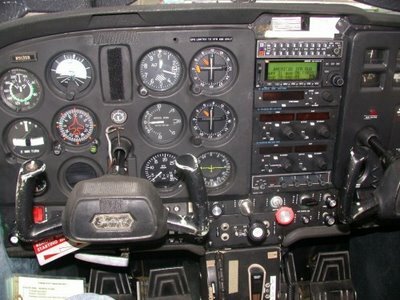 I've put a link on the right to a chart showing my progress toward the instrument rating. I think it's going to be fun!